Sergio Marchionne, the bombastic, sweater-wearing turnaround artist CEO credited with building the modern conglomerate that is Fiat Chrysler Automobiles, is reportedly exiting the company amid health issues, according to multiple news outlets. The FCA board of directors met Saturday to determine who would succeed him. Reuters reports that Marchionne is to be replaced “permanently” after suffering “serious complications from surgery.” His last public appearance was about a month ago in Rome. 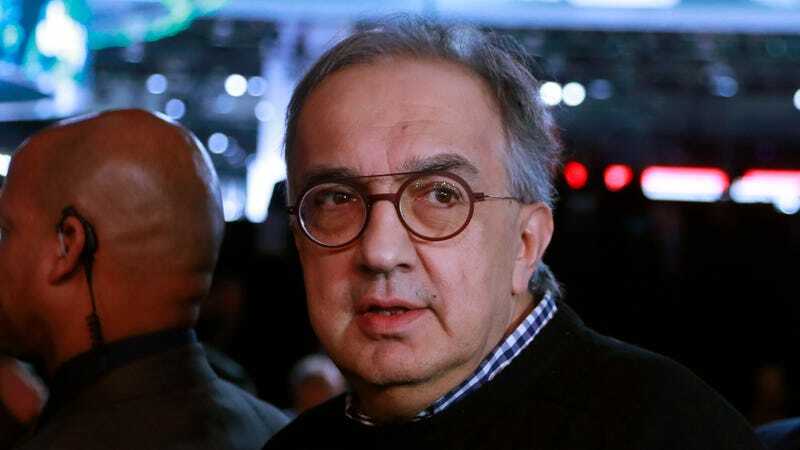 Marchionne’s apparent health issues and the board meeting to discuss a replacement are also being covered by the AP, Automotive News and Bloomberg, among other outlets. An email from Jalopnik to Fiat Chrysler seeking comment on the matter was not immediately returned. This story will be updated if and when that happens. FCA said earlier this month that Marchionne had undergone shoulder surgery and was in recovery. But the 66-year-old has since suffered “massive” and serious complications, according to the sources. Marchionne is also CEO of Ferrari. The Italian-Canadian executive took the reins of an extremely ailing Fiat in 2004 and helped turn that company around before acquiring a post-bankruptcy Chrysler in 2009. Now one of the longest-serving chief executives in the auto industry, he was due to retire in 2019, but this apparent issue may be speeding up his departure. Update 12:30 p.m.: The company has announced that Marchionne has been replaced by Jeep and Ram boss Mike Manley. With reference to the health of Sergio Marchionne, Fiat Chrysler Automobiles... communicates with profound sorrow that during the course of this week unexpected complications arose while Mr. Marchionne was recovering from surgery and that these have worsened significantly in recent hours. The Board of Directors of FCA, meeting today, firstly expressed its closeness to Sergio Marchionne and his family and underlined the extraordinary contribution, both human and professional, that he has made to the Company in these years.